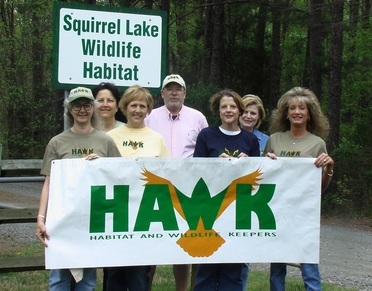 Habitat and Wildlife Keepers, the first chapter of the North Carolina Wildlife Federation, started out as the "Squirrel Lake Team", a group of gardeners and wildlife enthusiasts who adopted Squirrel Lake Park in Matthews and turned it into a demonstration site for how individual home owners could provide the five elements of a habitat and create a haven for wildlife. The park was certified in 2004 by the National Wildlife Federation as a Wildlife Habitat of Exceptional Merit. This rag-tag team of volunteers eventually became Habitat and Wildlife Keepers. WHAT ARE SOME OF HAWK'S PROJECTS? Leading the "Matthews Naturally" Community Wildlife Habitat Certification project. WHAT HAPPENS AT HAWK MEETINGS? HAWK meets the first Tuesday of each month from September through May at 7:00 P.M. at the Matthews Community Center, 100 McDowell St. (off of Trade St.). Meetings feature speakers who are experts in their field, such as wildlife preservation, native and invasive plants, solar energy, creating a backyard habitat, and air and water quality. Meetings are free, open to the public and family-friendly. HOW IS HAWK FUNDED? Through dues-sharing for new members of NCWF, sales of HAWKwear, raffles, private donations and special events. Funds are used to create wildlife habitats and support environmental projects. HOW DO I BECOME A MEMBER? If you are not already a member of NCWF, please consider joining. Go to NCWF.org or pick up an application at any HAWK meeting. HOW DO I FIND OUT ABOUT HAWK ACTIVITIES AND EVENTS? Go to the "What's Happening" page for details about monthly meetings, field trips and special events.